We also make personal leathergoods and business accessories, such as Custom Briefcases, albums, planners, portfolios, cell phone cases, belts and wallets. 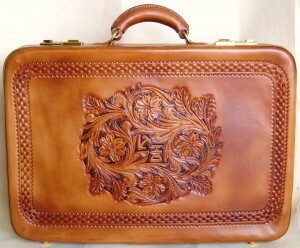 Custom orders are welcome-if you need a special case or other item, feel free to contact us. 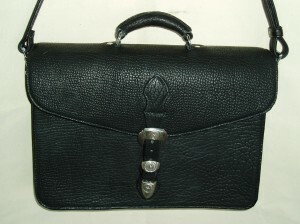 Most of the items we make are "one of a kind", although some items can be made in quantity for business gifts or awards. 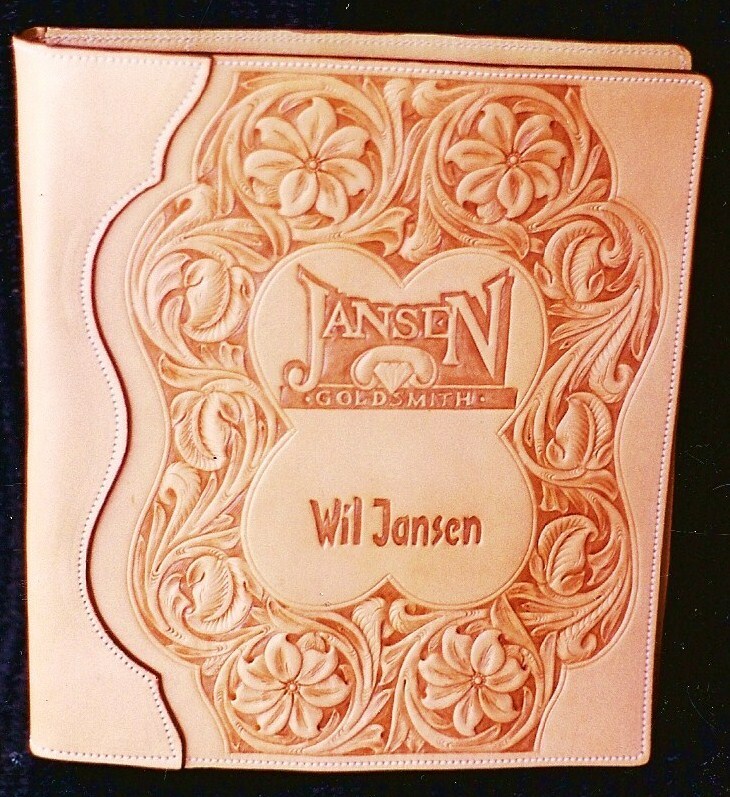 Whether you want one personalized album cover for that special anniversary, or 500 Business Card wallets with company logo for business gifts, you can be assured of getting the finest handmade leathergoods available. All our items are made to last,each one individually crafted in our Montana shop, using only the finest materials. Some of the more popular items we make are in stock , available for immediate shipment-you can purchase them directly from us at our Laurel store, online at www.montanasaddles.net, or from our eBay store,"WCS Handmade Leathergoods". 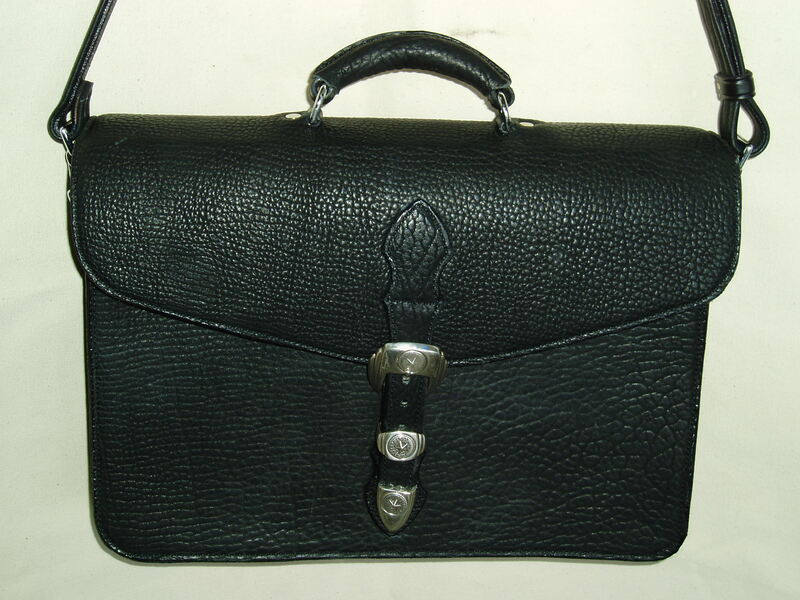 Any of the stock items can also be custom ordered to fit your needs. These sites have secure checkout for your protection. You can contact us at 1-800-835-3993, 406-628-9891, or email us at sadlbagz@montanasaddles.com. Business hours are 9-5:30 MST, Mon-Fri 9-5:00 MST Sat. 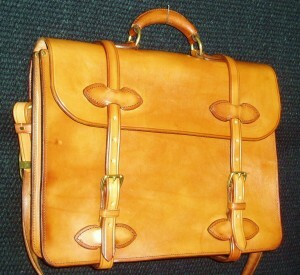 Generally, we ship within 2 weeks on custom orders, depending on our workload. 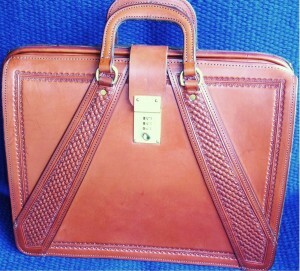 We accept Visa/Mastercard, Discover, American Express and PayPal. To the left is an example of the briefcases we make from exotic leathers, The briefcase shown is made from black American Bison (Buffalo) leather and is complemented with a sterling silver buckle set. 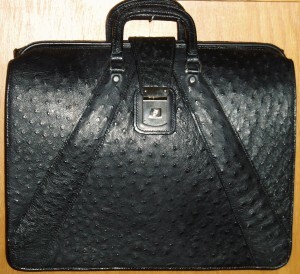 Many other leathers and colors are available-Alligator, shark, and Ostrich to name a few. 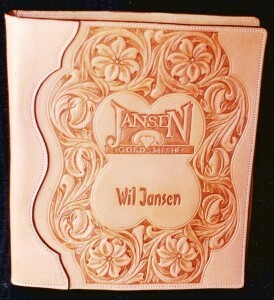 Shown below -Custom Album cover-Tooling,Custom Logos, or initials can be applied to any briefcase. 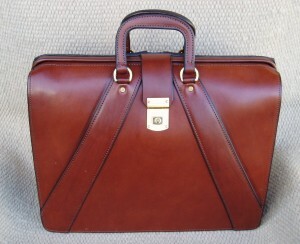 Classic valise style briefcase-This top open case is one of the most rugged, durable style briefcases available.Standard size is 16x14x5 (approx). 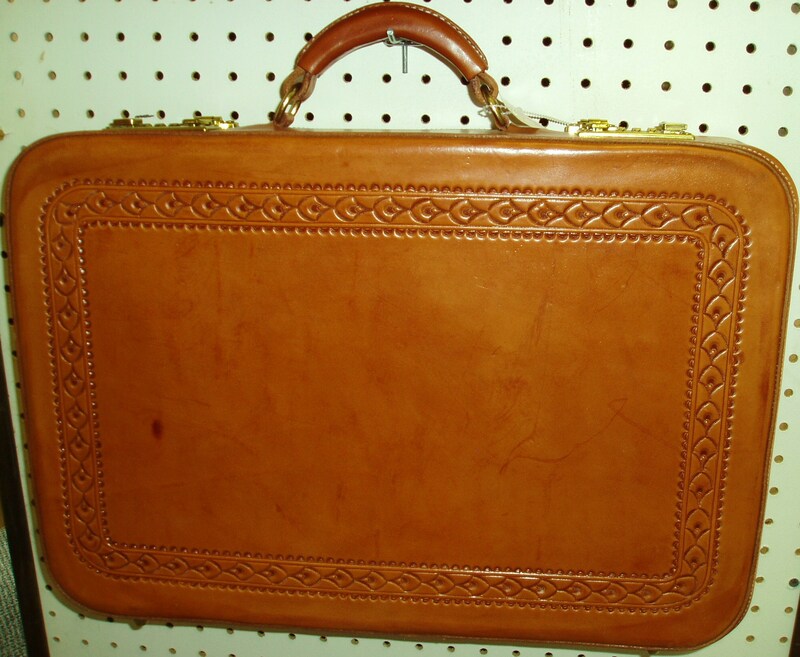 All our briefcases are made from top quality USA tanned skirting or bridle leather.Comparable in quality to the finest European made cases but much less expensive. 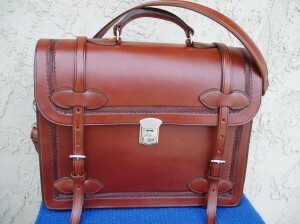 Custom sizes and colors available. 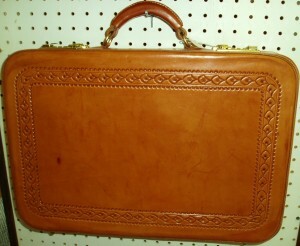 In stock in black and brown at our Laurel and on line stores. 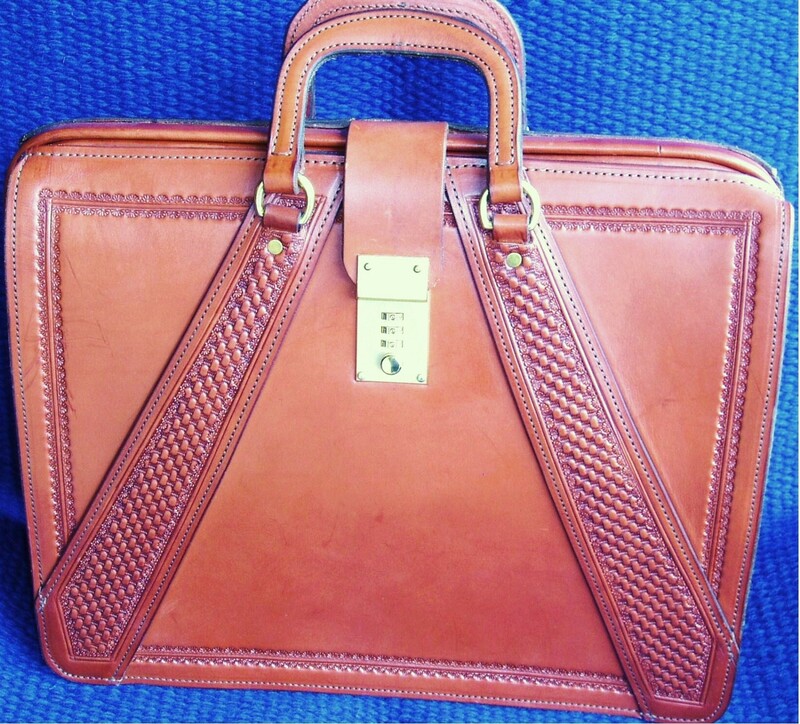 also available as a regular briefcase, custom sizes available.Our briefcases are comparable in quality to the finest European cases. 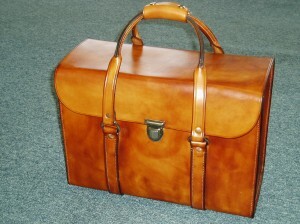 Pilots Case-an example of some of the specialty cases we make, available in top open style also. 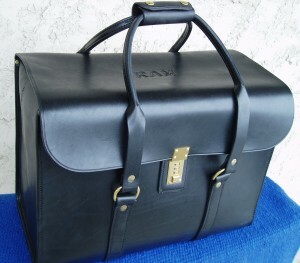 Attache case-approx 17x12x4,features welded aluminum frame,brass hardware. Choice of key or combination locks.Special order Item only.